At the Oak Bistro you will find a wide choice of British and modern European dishes. A typical menu may include fillet of sea bass with Mediterranean vegetables or chargrilled rib-eye steak with truffle butter. On finer days enjoy alfresco dining in the walled garden. Do you work at The Oak Bistro? What did you think of The Oak Bistro? 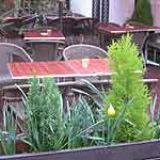 Excellent weloming atmosphere, neither intimidating nor down at heel- just happy, and enjoyable with, at last, after years of drab stained tables in other restaurants, beautiful white tablecloths and napkins, lovely clean loos and pleasant helpful staff. The proprietor was everything he should be, witty and attentive, really interested in good food and man who notes every detail, so things run smoothly and no-one waits a long time. The food- very good, well balanced flavours, fresh, perfectly cooked ingredients, and nicely plated. The sauces were perfectly reduced and fresh-tasting. We had fish cakes, lamb shank and crab linguine, so a fair trot across the repertoire, and each dish was delicious. All the vegetables were tender and the creamed potato was utter heaven and should be served by itself. If you want to go to heaven, have a pudding with the plum -infused sake. I was completely against this intially, not being keen on sake, and never having mixed sake with a pudding. My ignorance was overcome with a light , slightly christmassy -fruit flavour that perfectly complemented the fruity pudding. Very glad we tried it. We all loved it, and shall go back when next in Cambridge- be warned! it is very popular -book your table early! This is a moderately expensive restaurant but it undoubtedly has real class. 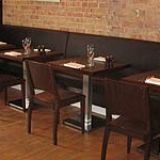 The dining space is varied and comfortable, not crowded; the reception and service is discreet, polite and very assured. The menu shows a careful selection of dishes, the standard of preparation is excellent: nicely presented, generous and refined. The coffee is top-rate. By comparison with several other dining-places in Cambridge, the ambiance is not noisy; it's possible to have a decent conversation while enjoying a meal for two. The place fully deserves a high recommendation. The Oak Bistro provides a truly wonderful dining experience. The level of customer service is superb, the staff are friendly and welcoming - nothing is too much trouble. 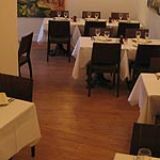 The restaurant is immaculate and tastefully decorated both in the inner and outside dining areas. The food, well it is absolutely to die for. 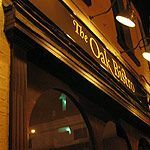 I have dined in restaurants where the surroundings and fare provided have been far less impressive than at Oak Bistro but which are a good deal more expensive. In summary I would highly recommend Oak Bistro and for myself I will never dine elsewhere when I am in Cambridge. I booked the Restaurant through Top Table after having read the reviews. The service and food was excellent and will be booking to go there again within the next month.